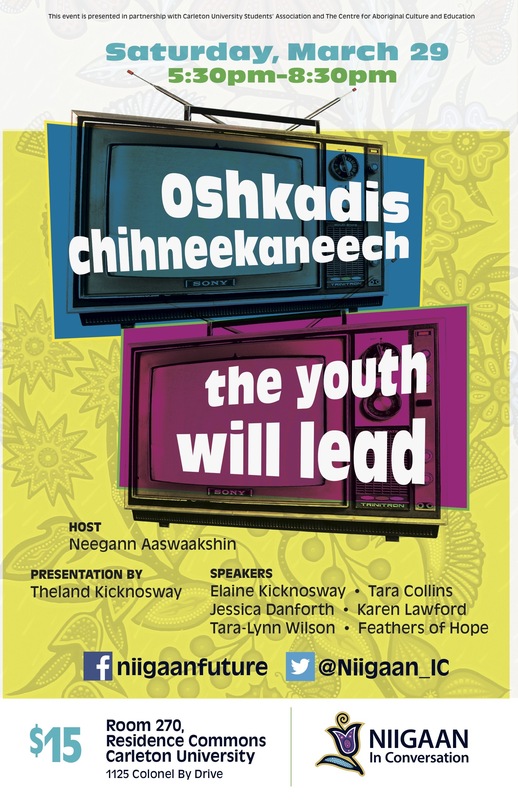 Niigaan | Anishinaabemowin: ahead, leading, in front, the future. Our friend Greg Macdougall at Equitable Education filmed the complete discussion of our December 10, 2013 Returning to Ourselves event. 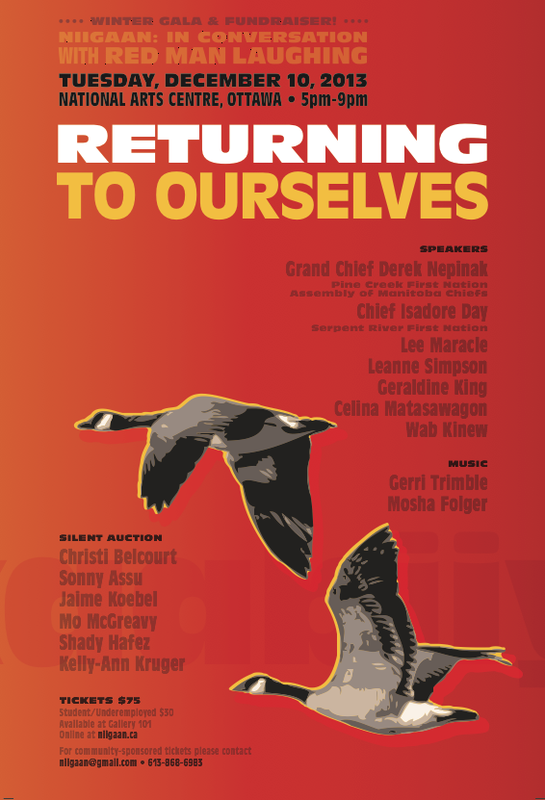 From left to right is Wab Kinew, Celina Cada-Metasawagon, Geraldine King, Leanne Simpson, Chief Isadore Day, Lee Maracle, Chief Derek Nepinak, and Ryan McMahon. Gchi miigwech to host Ryan McMahon and all the speakers who contributed their voices to the Niigaan Winter Gala Fundraiser! Our Winter Fundraising Gala is just two days away! We are so excited to share with everyone a fantastic evening of conversation, music and dancing, great food and most importantly: celebration. Winter Time is the time of year where the earth becomes covered in snow. It’s a time for rest and reflection. Last winter we rose. We did not rest, we did not reflect. We took to the malls, the streets, and the hills. The community rallied around, there was a desperate feeling, people gathered at teach-ins, the scent of medicines was everywhere. We need to get that energy back. Niigaan: In Conversation asked ourselves, what happened to the fire? The problems are still here, we still have work to do. Let’s get together as a community and talk about our future. 5:30 –Performances by surprise musical guests, Lawrence Martin and Zorga Qaunaq! It is very important to is that children be made welcome and are included in community events such as this. We will have some skilled childminders to keep an eye on children over 6-years old (contribution requested), so bring your family! The National Arts Centre will be catering dinner included with ticket purchase. The National Arts Centre will also have a cash bar at the Biskaabiiyang Gala. Finally, we will be accepting credit card payment, either at the door or for Auction purchases. Niigaan: In Conversation would be very grateful if you would consider showing your support by participating in the silent auction at our Winter Gala and Live Podcast with Red Man Laughing. Funds raised will go towards developing workshops that respond to community needs and current events, assisting and supporting other grassroots educational initiatives, and organizing three more flagship events in 2014. We also want to continue releasing and distributing our video and audio of past events so that other communities can access and use the material. We will also expand on the work that we are doing. Right now, we are developing a new project with other partners around concepts of community and culturally-based responses to violence, abuse and missing and murdered women. We also want to work with partners to develop land-based workshops to reconnect people can with their land, teachings and traditions. The silent auction will help us contribute more to our community. 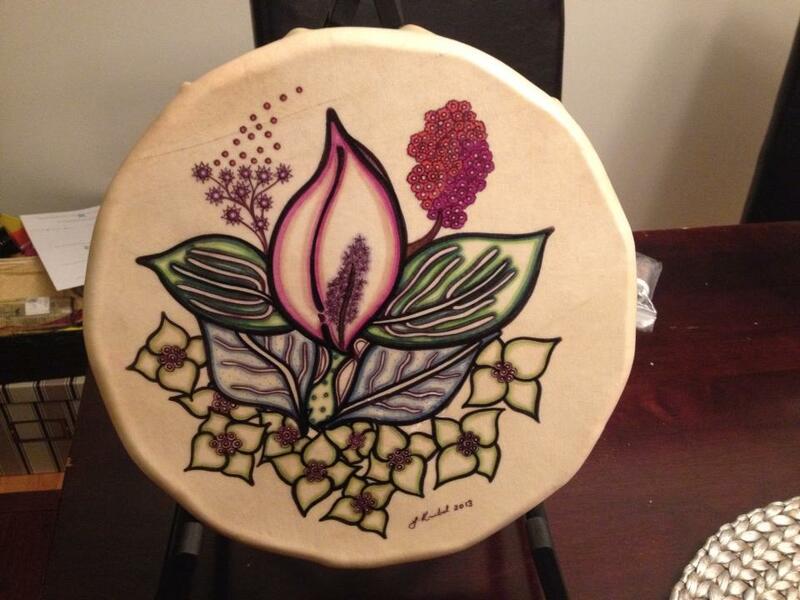 We will share the proceeds of the silent auction with Christi Belcourt’s Walking With Our Sisters project. It has been inspirational to see the wide level of international community support of a grassroots initiative. 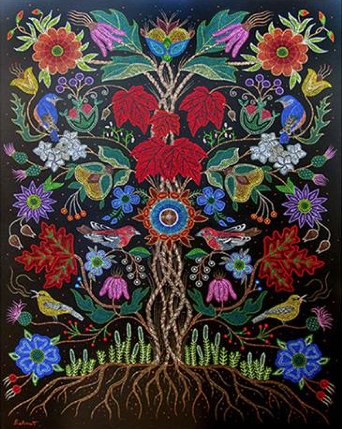 Christi Belcourt has been a Niigaan supporter from the beginning. She allowed us the use of her artwork in Niigaan posters, our logo comes from her art and she donated piece to the silent auction. The work of the WWOS project also reflects the values of what we have been trying to promote. Particularly what we have seen as a cultural resurgence – the effects of people coming together to learn how to bead and creating the vamps that recognize and honour the women we have lost who are missing or have been murdered. Christi has integrated ceremony and artistic practice to build relationships and community. Christi Belcourt is a Metis visual artist with a deep respect for the traditions and knowledge of her people. The majority of her work explores and celebrates the beauty of the natural world. Author of Medicines To Help Us (Gabriel Dumont Institute, 2007), Beadwork (Ningwakwe Learning Press, 2010) Christi has won recognition for her fine artistry through numerous exhibitions. Her work has been commissioned by the Gabriel Dumont Institute (Saskatoon), the Nature Conservancy of Canada and the Centre for Traditional Knowledge & Museum of Nature (Ottawa), the Indian and Inuit Art Collection (Hull) and is found in the permanent collections of the Thunder Bay Art Gallery and Canadian Museum of Civilization, First People’s Hall. Christi is a past recipient of awards from the Canada Council for the Arts, the Ontario Arts Council, the Chalmers Family Fund and the Métis Nation of Ontario. She has been studying traditional plants and plant uses for numerous years. Regarded as a ‘Vanguard’ for his piece 1884/1951 in How Soon Is Now? (Vancouver Art Gallery, 2009), Sonny Assu continues to push the boundaries of contemporary art by challenging the perception of Indigenous art. Assu merges Indigenous iconography with the aesthetics of popular culture to challenge the social and historical values placed upon both. An exploration of his mixed ancestry, his work appropriates or transforms items of consumer and popular culture to trace the lineage of his own personal life. Interested in ideas around Indigenous issues and rights, branding and new technologies, he works across many boundaries and disciplines and in doing so, reveals a ravishing oeuvre that speaks to many. Assu’s work has been featured in several solo and group exhibits over the past years, notably Don’t Stop Me Now! and Comic Relief at the National Gallery of Canada, Beat Nation and How Soon is Now? at the Vancouver Art Gallery and Changing Hands: Art With Reservation Part 2 at the Museum of Arts and Design in New York City. His work has been accepted into the National Gallery of Canada, the Seattle Art Museum, the Museum of Anthropology at UBC and in various other public and private collections across Canada and the United States. Sonny is Liǥwildaʼxw of the We Wai Kai First Nation (Cape Mudge). He graduated from the Emily Carr University in 2002. He received the BC Creative Achievement Award in First Nations art in 2011 and was long-listed for the 10th annual Sobey Art Award in 2012. He currently lives and works in Montreal. 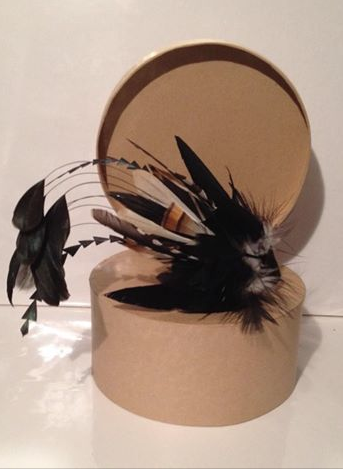 Jaime Koebel is a Métis Artist & Indigenous Arts Activator from Lac La Biche, Alberta. Jaime draws images of plant, animal & insect life with ink on animal skins. 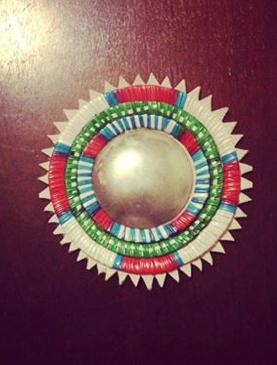 She also creates fish scale art & is a Métis cultural dancer. In 2009, Jaime was invited on a State visit with former Governor General Michaëlle Jean to Guatemala, Mexico & Costa Rica. Her passion is to educate social, political & cultural issues through Indigenous Art. Jason Mullins is a member of the Bird Clan from the Cherokee Nation. He was born and raised in the Bronx, New York where his family had relocated from Kentucky in the 1950’s. Surrounded by a family of traditional artists, which included carving, sewing, bead work, painting and the culinary arts, they inspired him to find his own style and express his artistic vision. Shady Hafez is an Algonquin/Syrian from Kitigan Zibi Anishinabeg. Born and raised in Ottawa he currently attends Carleton University completing a double major in Canadian Studies and Law with a minor in Indigenous Studies. He specializes in traditional art forms such as beadwork, quillwork, bustle making, regalia making, rawhide paintings and sewing. He is also a mens traditional dancer who travels across Indian country every year competing at Powwows. Shady has also been recognized for his creative writing with his short story “change of the season” having been recognized as one of the top ten stories in the national Aboriginal Writing and Arts Challenge. Shady’s artistic aspiration is to learn and master traditional art forms so that he may pass them on to younger generations, in that those art forms may not be lost. Niigaan: In Conversation was started by a conversation. The day we knew that Chief Theresa Spence intended hunger strike was a day much like this one: grey, snow lightly falling, long nights, anticipation in the air. We met with friends to talk about what was happening: chiefs breaking away to march to the Hill, Idle No More teach-ins, setting up camp on the Island, calls for firewood and medicines. We remember songs and drums around the fire, the resonance of a drum beat in a shopping mall, and the scent of sage everywhere. Most of all, we remember the determination to ensure that this time would be the last time people would need to rise up for justice. In the spirit of that moment, Niigaan: In Conversation was born. We wanted to contribute to our community here by creating a space for people to come together and talk. We knew that this strange city of bureaucracy and federal politics continues an ancient tradition: it acts as a meeting place. Niigaan: In Conversation is really about relationship building, which is another ancient tradition in this land; at every event we always offer food and there is always conversation so that people can talk with each other. Never in our wildest imaginations would we have predicted that over nine months we would develop new and wonderful relationships, organize 12 public events and a handful of private ones, or develop projects with others across Turtle Island. The way things are now in this country is not working for everyone and it needs to change. Solutions have to emerge from within our own communities if they are going to be sustainable, forward-looking, and long-reaching. We’re not saying that we have the answers to everything, but we are willing to provide the time and space to have the conversation to work this out together. Niigaan: In Conversation is four volunteers; we are students, parents, business-owners, working artists. It takes a lot of late nights, community support, private donations, partnerships with NGOs and community organizations, and other dedicated volunteers to pull off every event we hold. It takes a lot of commitment to relationship building. Here on unceded Algonquin territory, Niigaan: In Conversation has plans to contribute to the heavy work of unifying our community. We want to develop more workshops that respond to community needs and current events, assist and support other grassroots educational initiatives, and organize three more flagship events. We also want to continue releasing and distributing our video and audio of past events so that other communities can access and use the material. We also want to expand on the work that we are doing. Right now, we are developing a new project with other partners around concepts of community and culturally-based responses to violence, abuse and missing and murdered women. We also want to work with partners to develop land-based workshops to reconnect people can with their land, teachings and traditions. Our gala fundraiser will help us contribute more to our community. We have hope for this shared future that we are asking people to recreate together. We can see people coming together to do the very difficult work of listening to each other to strengthen community. We see the language classes and camps, we see examples of traditional government, we see protectors of the land, and we see conversations happening. It isn’t easy work but it is an art – we won’t know what it’s going to look like until we are done. We can use techniques that we know will work, but we also have to be open to trying new things and being innovative in our approaches. Gchi miigwech Ogichidaakwe Spence; we will not forget your example and leadership. We must remember that Chief Spence’s hunger strike was one of many gifts that we received last winter to inspire us. Her strike and the actions of others – the Nishiyuu Youth, the rallies, the dances, the ceremonies, the prayers, the helpers – all embody our deep desire to make real and lasting change by demonstrating our dedication to and relationship with this land and each other. These actions penetrated us to the core, brought up ancestral memory and propelled us to act. Now we must internalize that energy. It is our hope that these conversations will turn into relationships, that will turn into ideas, that will turn into actions that every person will take on as their own. There is so much work to do in so many areas; none of us can do it alone. Niigaan: In Conversation will be there to facilitate, to create the space and time; the rest is up to everyone who joins us in the conversation. This week, Niigaan: In Conversation is pleased to present a series of essays written by our friends and allies who, through their work, are rebuilding relationships and reenvisioning our future. As part of the planning process behind our upcoming gala, we asked ourselves, what happened to the fire? The community rallied around Chief Spence, there was a desperate feeling, people brought wood, food, soup, medicines, water. We need to get that energy back. The problems are still here, we still have work to do. There is a word in Inuvialuit that describes a drifting snow. That word is Natiruvik. And it was taught to me by Roy Goose, an Aboriginal interpreter who speaks, no exaggeration, about twenty different languages. Then there is an Inuktitut word that describes a wind that blows low along the ground and picks up drifting snow in its wake. And when it comes to another pile of snow, it picks that up and moves it along the ground and the pile gets bigger. That word is Natiruviatuk it was taught to me by the Inuk singer/songwriter Susan Aglukark. Idle No More is a kind of natiruviatuk, I think. It started low along the ground, the grassroots, and picked up the snow…the energy, interest and people as it moved along. And like wind, sometimes it’s more evident than others. But it doesn’t go away. 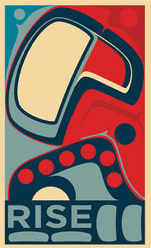 When Idle No More first started gaining strength and numbers a year ago, it didn’t take long for the momentum to build. Round dances and peaceful blockades soon became teach-ins and spreecasts. Indigenous and non-Indigenous people were there together in a space for dialogue. For me, it’s been the education I didn’t get in school: a crash course in what colonialism means, what it did, what it still does. How it is a system, a structure. How it takes what is not one’s to take, how it has shaped this country. I was so moved by the long walk of the Innu Meshkenu from Northern Quebec. They walked through the winter of 2013. When they arrived on Parliament Hill in May, I was told that there were about 2000 people there to greet them. In mainstream media reports, the last zero was dropped. The headline that day was about pandas coming to the Toronto Zoo. 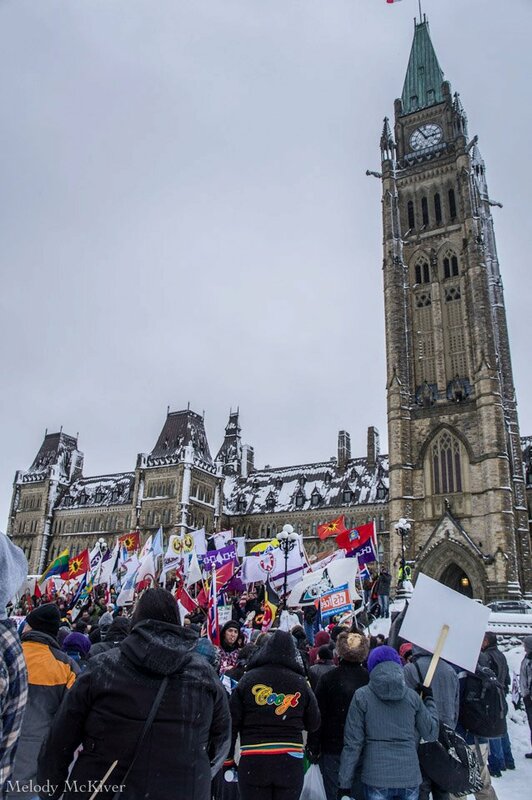 It reminded me of the first big Idle No More weekend of action, right across the country. The lead story on the news that night was the Ikea monkey. Surely that was a kicker, a closer. Surely, Aboriginal and non-Aboriginal people coming together, often for the first time in their lives, surely that was a lead. But I see hope in places where the media don’t go. This past winter, I was in Nain, Labrador and I met up with a young friend named Dorothy Angnatok. She has created a program where youth go out on the land, harvest country food and bring it back to a community freezer. The youth distribute it to the elders. She told me at first, the kids were shy about going to the elders homes. Now they run to their doors. They can’t wait to hear their stories and to share the food they have caught themselves. This project has brought hope and renewal to the young people and to the elders. It has improved mental health, food security and built bridges between the generations. I was in Massett, Haida Gwaii this spring for a golf tournament for literacy. Two respected elders, Elizabeth Moore and May Russ, took me away from the event to teach me how to fillet fresh salmon. I was just awful. My salmon was ragged. I blamed my dull knife (yes, I know good carpenter never blames her tools). But the truth is, I wasn’t listening fully. The women took me through the process again and again until I got it. In other words, they didn’t give up on me. Even when I made stupid mistakes. My other indigenous teachers (many of whom are on twitter where I first learned about Idle No More) haven’t given up on me either. Their patience and generosity blow me away. Idle No More is about a whole bunch of words that start with R: respect, restoration, recognition, responsibility, relationship, resolution, resilience, reconciliation, resurgence, reciprocity…name your R.
We need to create more places and spaces for learning and dialogue. Dialogue is the beginning of a conversation and this is a national conversation that has to happen. We need to understand and respect treaties. We need to understand why we are where we are and who we are and what we did. And do. More of this. Less of pandas and monkeys.